Summit Point Motorsports Park is a little bit hidden from mainstream view, tucked away in a corner of West Virginia on the State-line and off the pro-series schedules for many years, yet manages to eke out a successful existence through club racing, track days and driver training. The circuit originally opened in October 1969 as Summit Point Raceway, one of a burgeoning number of road circuits which opened in the 1950s and '60s to cater for the expanding US interest in sportscar racing. Perhaps Summit Point was a little late to the party, but it did at least have the advantage of little in the way of competition, with few other venues in the Baltimore-Washington area. The original course was a slightly shorter 1.85 miles and featured eight turns, compared to the current 10. Turn 5 was a near 90 degree left-hander leading to a 90 degree right-hander at the entry to what is now denoted Turn 8. After just 12 months it was decided this layout was unsatisfactory and a new complex of turns was added - known as the Carousel - was added, bringing the lap length up to 2.0 miles. At first the circuit enjoyed some promising success. Among the series to race there were the IMSA International Sedans (later to become The Radial Tire Series) and IMSA Pro Formula Ford, both of which featured in the inaugural race meeting on Memorial Day, May 30, 1970, with Rasey Feezell winning the sedan race in an Alfa Romeo 4 door sedan. Through the 1970s, the SCCA also held numerous races, with regional and national races run each year. Among those taking part was film star Paul Newman, who indulged his taste for speed by running several races in a Bob Sharp-prepared Datsun 510. Keen to separate his racing activities from his more celebrated exploits on the big screen, Newman and wife Joanne Woodward kept to themselves and eschewed signing autographs - in fact race spectators generally had little clue as to the celebrities in their midst! Like many of the crop of road-courses which has flourished in the previous decades, as the 1970s wore on, so times became tougher. The energy crises had a big effect on racing and as costs rose and participation declined, so circuit finances became stretched. In Summit Point's case, things came a head at the end of the decade and the track briefly closed in 1979. Into the breach stepped former Formula Vee World Champion Bill Scott, who purchased the bankrupt facility in 1980. Under Scott's tenure the circuit's fortunes were to be dramatically revived. In addition to racing - IMSA's events and the SCCA Trans-Am Series would continue until the late 1980s - increasing amounts of track time were devoted to racing schools and driver training. Soon this would become the major focus for the circuit, to the extent that pro-racing had all but ceased, with club and amateur races the mainstay for competitive action. By the mid-1990s, the amount of track activity was becoming a problem. Scott had become something of a market leader in providing training for in accident avoidance techniques from defensive driving to counter-terrorism tactics for the police and other Federal agencies, and demand for track time was now far outstripping supply. The solution was to build a second course, the Jefferson Circuit, which opened in 1996. This was a seven-turn, 1.12-mile (1.80 km) road course, designed and built as a dedicated course for high-performance, accident avoidance and emergency operation driver training. At around this time the name Summit Point Motorsports Park was adopted to reflect the multi-course configuration. Usually run clockwise, the track has occasionally also been used in the opposite direction. Still the demand for track time grew and within a few years Scott was busy planning another extension to the motorsport facilities, despite some significant oppositions from local residents. In 2004 the vision became a reality when the Shenandoah Circuit, to the north-west of the original course, opened for business. 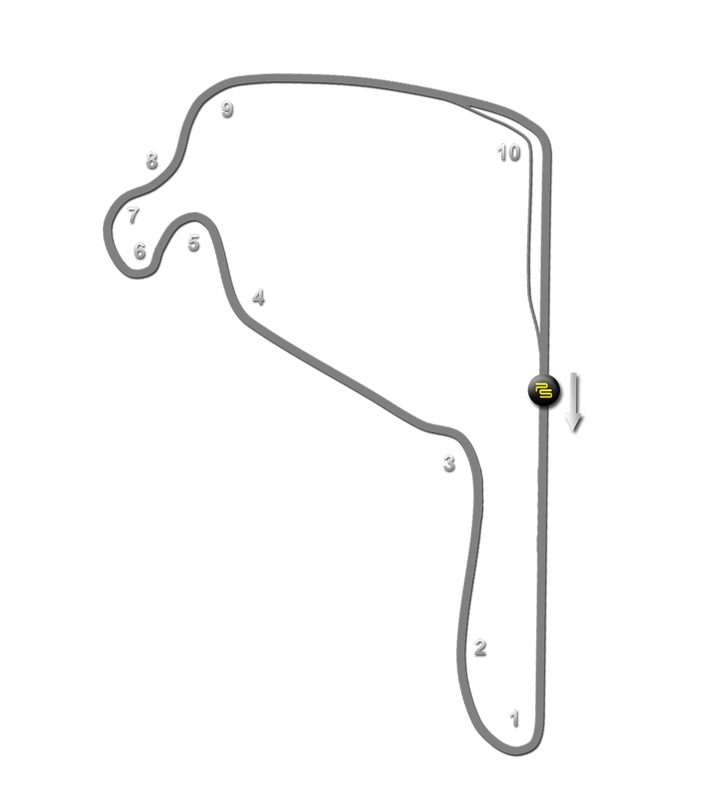 This was a 22-turn, 2.2-mile (3.5 km) road course with multiple different configurations and elevation changes, intended for high-performance driver education clinics and club road and motorcycle races. It's signature corner was a reproduction of the famous Karussel turn on the Nürubrgring, complete with rough concrete banking. Minor tweaks were made to the Shenandoah course in 2005, including the addition of a straight between turns 5 and 7, and 2007, when several chicanes were included for use by motorcycle races. Generally run in a clockwise event, the circuit has on occasion also been run in the opposite direction. With the course now being among the most active of the three road courses for track day use, large numbers of course variations have been used - we've included some of the more common in our plans. Racing has also been held here for the Bill Scott Formula Series. A separate facility (known as the Washington Circuit) opened in 2009 and was the last major development overseen before Scott's death in December of that year. It is a "triple skid pad" focused on autocross and driver training and also incorporating a sprint kart track, hosting events by Summit Point Kart and by the Maryland Sprint Divisional Series. More recently, a 0.6-mile extension to the Jefferson Circuit was opened in 2014, which included a new skid pad within its confines. It continues to hosts time trials, motorcycle events, and numerous performance driving events, running on both its extended and original variations. Today, Summit Point Motorsports Park continues under the stewardship of Bill Scott Racing Inc. The main course no longer holds professional races, but continues to host many WKC, WKA, SCCA, Audi, Mazda Drivers, BMWCCA, NESBA, and NASA club races, track days, and schools. In addition, motorcycle races are run by CCS and WERA, which also holds national-level 6-hour endurance race. The annual Jefferson 500 vintage race and The 12 Hours at the Point endurance race are season highlights.